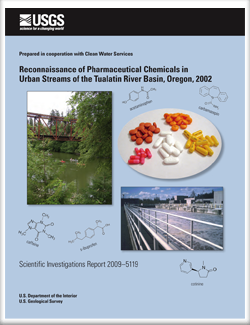 A reconnaissance of pharmaceutical chemicals in urban streams of the Tualatin River basin was conducted in July 2002 in an effort to better understand the occurrence and distribution of such compounds, and to determine whether they might be useful indicators of human-related stream contamination. Of the 21 pharmaceutical chemicals and metabolites tested, only 6 (acetaminophen, caffeine, carbamazepine, codeine, cotinine, and sulfamethoxazole) were detected in filtered stream samples from 10 sites. The concentrations of most of the detected compounds were relatively low (less than 0.05 microgram per liter). The most frequently detected compounds were cotinine (a nicotine metabolite, 8 of 10 samples) and caffeine (a stimulant, 7 of 10 samples). More compounds were detected in urban stream samples than in samples from forested or agricultural drainages. Filtered water samples also were collected from four locations within an advanced wastewater treatment facility to quantify the relative amounts of these chemicals in a municipal waste stream and to determine the degree to which those chemicals are removed by treatment processes. Fifteen pharmaceutical chemicals or metabolites were detected in wastewater treatment facility influent, with concentrations far exceeding those measured in streams. Only five of those compounds, however, were detected in the treated effluent (carbamazepine, cotinine, ibuprofen, metformin, and sulfamethoxazole) and most of those were at concentrations less than 0.2 microgram per liter. The target pharmaceutical chemicals and metabolites showed limited potential for use as tracers of specific types of human-related contamination in Tualatin River basin streams because of widespread sources (caffeine, for example) or extremely low concentrations. Caffeine and cotinine are likely to be good indicators of sources that can occur in urban areas, such as sewage spills or leaks or the widespread use and careless disposal of tobacco products and caffeine-containing beverages. Neither compound, however, is likely to be a good tracer for a specific source unless that source is large. The presence of 1,7-dimethylxanthine (a caffeine metabolite) concurrently with caffeine might indicate the presence of untreated wastewater; in contrast, the absence of the metabolite might help rule out that source. Acetaminophen might make a good tracer for untreated wastewater because of its common usage, high concentration in raw wastewater, and effective removal via treatment. Carbamazepine and sulfamethoxazole have the potential to be good indicators of treated wastewater because of their incomplete removal in treatment facilities. Some of these pharmaceutical chemicals, either singly or in combination, might prove useful as tracers of contamination after further study. Rounds, S.A., Doyle, M.C., Edwards, P.M., and Furlong, E.T., 2009, Reconnaissance of pharmaceutical chemicals in urban streams of the Tualatin River basin, Oregon, 2002: U.S. Geological Survey Scientific Investigations Report 2009–5119, 22 p.